Common in breeding season throughout most of California. Absent to uncommon in most of state in winter, with greatest concentrations in coastal regions. Not found at highest elevations in Sierra Nevada. Occurs in open stages of most habitats that provide adequate cliffs or large trees for nesting, roosting, and resting. Feeding: Primarily eats carrion; rarely rotting fruit, live birds, eggs, or live mammals. 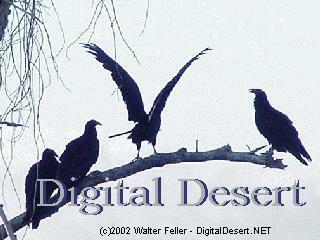 A highly specialized static soarer, foraging aerially over roads, fields, open forests, and nearly all open habitats. Searches for carrion from the air and from a perch, aided by sense of smell. May rob young herons of food (Temple 1969). Cover: Large trees, rock outcrops, and riparian thickets are used for roosting, perching, and sunning. Reproduction: Cliffs, rock outcrops with rims, ledges, and cavities in trees, snags, and logs used for nesting. Water: Drinks occasionally (Brown and Amadon 1968). Captives have been observed for 6-12 mo without free water (Hatch 1970). Pattern: Suitable habitat consists of extensive open areas with protected nest and roost sites provided by large trees, snags, thickets, shrubs, and rock outcrops. Seasonal Movements/Migration: Migrates south or downslope for winter. Some individuals in coastal regions winter in California. Remainder of population migrates, mostly to Central America, for the winter. Large flocks concentrate along well defined, traditional migration routes in autumn. Home Range: No data found, but observations indicate turkey vulture uses extensive areas. Individuals regularly forage out 24-32 km (15-20 mi) from roost or nest. Territory: Little evidence of territoriality found. 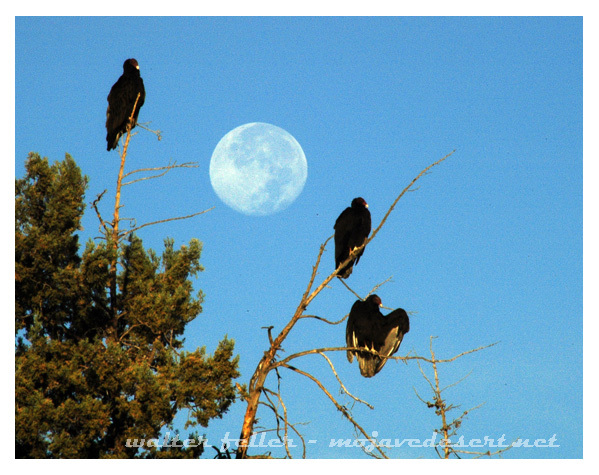 In California, as many as 500 juveniles observed using communal roosts August through October. Reproduction: A ritualized display including several individuals may precede mating (Loftin and Tyson 1965, Brown and Amadon 1968). Lays 1 clutch/ yr of 2 eggs, rarely 1 or 3. Incubates 38-41 days (Brown and Amadon 1968). Semialtricial young hatch with eyes open; cared for by both parents for 80 days, or more. Niche: Often feeds with ravens and condors, although apparently subordinate to each. Golden eagles and coyotes may keep turkey vulture from carcasses. Large, ugly and disgustingly repulsive the bright red-headed Turkey Vulture (Cathartes aura) can be seen migrating in groups of up to a hundred across the Mojave. These large birds have wingspans of 6 feet average and white feathers under their black wings to enable them to better soar using thermal air. They feed on rotting carcasses and feed their young for the first few days by regurgitation. The Turkey Vulture is a raptor.